The Bankside Urban Forest is one of the plans to regenerate East London, in par ticular the neighbourhood extending from the river edge down to the south, bordered by Blackfriars Road and Borough High Street, and transform the capital within sight of the London 2012 Olympic and Paralympic Games. Valerie Beirne, the urban forest manager at Better Bankside , commissioned the work with a number of local agencies. The client group selected the Witherford Watson Mann Architects from amongst 11 competitors. The name “Urban Forest” is a metaphor that evokes the network of streets, scattered open spaces and strong local identity of the area. The strategy of the group is to make Bankside, a mixed neighbourhood of 6,000 residents, 60,000 employees and 6 million annual visitors, a better place to live, work and visit. The main idea is to enhance the attractiveness of the suburb providing high quality public spaces, where different social groups can interact and where people can choose to live and work. The plan ranges from small tree planting to temporary projects and large scale onces, such as Flat Iron Square. The group proposed a planted or a ‘furry’ arch. This takes the form of a series of planted vertical panels and trays that line the arch, enabling them to trail creepers around the vault. An irrigation system have been provided behind the panels and growing lights. The panels can also be used to reduce the resonance within the viaduct arch. They also proposed planting clumps of Ash trees in order to create more generous corners and sections of footway claimed back from the road. This Victorian viaduct has been transformed by Light at the End of the Tunnel, a project to transform the railway viaducts in order to create job opportunities and promote investment in this part of Southwark. Tate Modern presents a rare opportunity to create a significant new public space within the framework, a place of exchange. The Herzog and de Meuron structuring of the Tate imagined two sections that define the Turbine Hall. The proposal is to increase the difference either side of theTurbine Hall and embed Tate Modern into the forest. This project allows the Turbine Hall to be discovered as a ‘clearing’ in the forest. Also, the project provides the reduction of the vehicles moving through Sumner Street and the creation of diagonal pathways that cross the playground. Flat Iron square used to be a street but was closed in 2011 into create a new ‘place of exchange’. The BUF decided to close one of the two wide one-way roads and reconnecting the island to the shops on the north side. With more room for pedestrians, and linking the Island Café to the existing parade of shops, the square is set to get a new green roof which is currently on site. Also, a new stone surface establishes a connected pedestrian ground, evoking qualities of the forest floor. Since the new space opened in 2011, a range of creative activities have been hosted in the square, including Union Press a temporary commission by public works in June 2012 and more recently a mural by Fiona Banner on the north wall of the square as part of the Merge Festival 2012. The improvements of the Redcross Way were launched in 2010 and funded by Transport for London, as part of their Key Walking Routes initiative. The project links open spaces in the neighbourhood while enabling streets to become more enjoyable and safe for pedestrians. The pavements are wider compared to the rest of the neighbourhood and cycling is encouraged by provision of cycle parking along with 20 new trees. In addition to enabling the tracking of individual projects and encourage private initatives, the project map will help community groups to finance public projects by strategically targeting funds anticipated from larger private developments. The projects officer will also act as a liaison between interested parties, communicate the strategy to the wider community, and oversee the implementation of the key Forest projects. The scoped up key projects provide opportunities to secure short term under-spend or long lead in funding as their initial design principles, technical issues, constraints and costs have been considered. Different local stakeholders should be responsible for delivering these key projects over the longer time period based around the funding, ownership and management criteria. Increasing the opportunities for ‘sharing’ the local ‘urban interior’ and the rapidly developing edges within Bankside and Borough. That the Urban Forest is the characterisation of this distinctive area of London, based upon the existing spatial qualities that underpin the area’s identity; meandering streets, multiple routes, clearings, clusters of vaulted and canopied spaces. That evolutionary change takes place in a coordinated way, meshing existing projects and initiatives with new opportunities. 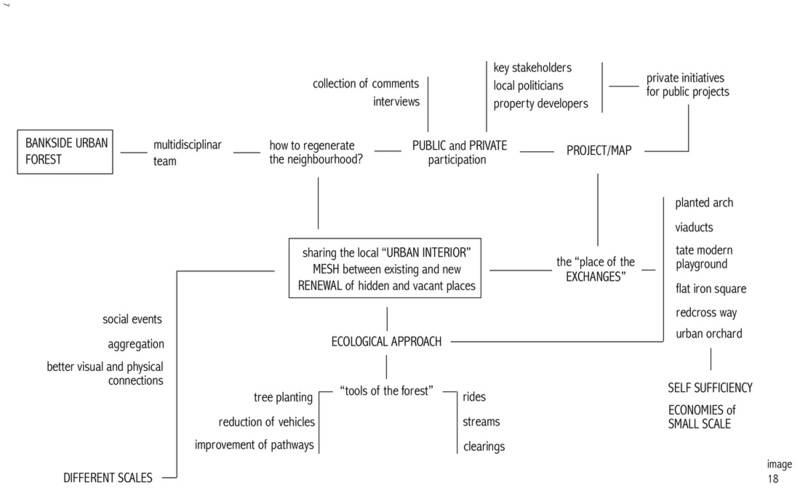 That an ecological approach to urban regeneration based on networking, self- sufficiency, and ‘economies of small-scale’ will create a new sense of urban equilibrium between contrasting economic, social and cultural groups. A collective project based on shared principles that establishe a new model for regenerating the public realm in London to attract significant public and private partners and investment. The architects group has proposed several projects that incorporate new trees, vertical planting, public art, hard landscaping and lighting in order to illustrate how the Bankside ‘forest’ could be realised. This investment will be coordinated through local stakeholders to improve the network of pedestrian and cycle routes, public spaces and developments, in order to enhance the quality of life for people living and working in the area.